Being the Peanut Butter Boy is a tough job, there seems to be an endless supply of peanut butter brands and varieties. I’m not complaining though, and if you run your own nut butter company I’ll gladly review your nut butters! This round of reviews covers some fairly common brands and varieties. My current favorite peanut butter is also reviewed, I think I’ve waited so long to review it because I’ve been busy inhaling jar after jar. There is 1 review of a brand that I have never seen before but luckily the Peanut Butter of the Month Club brought it to my doorstep. I can proudly say I have 5 more peanut butters under my belt. Read on for the reviews or to see all of my peanut butter reviews, click here. My new favorite peanut butter. This creamy peanut butter has a fairly coarse grind which makes for a wonderful grainy, almost gritty texture. It is also perfectly salted despite a lower sodium content than most other salted peanut butters. The peanut flavor is outstanding. I use this peanut butter for everything, but my preferred method of consumption is with a fork. It is truly a meal in a jar. I recommend it for everything including making flavored peanut butter like spicy or cinnamon raisin. As a bonus, this is also the cheapest peanut butter on the market ($1.79, 18oz) and can be found easily, since it is the store brand of Whole Foods. My other new favorite peanut butter. This crunchy peanut butter has the same gritty coarse grind with the additional of some fantastic chunks in between. Again, it’s perfectly salted despite a lower sodium content. I tend to use this variety for sandwiches, but I bet this would be great for making cinnamon raisin peanut butter for some additional chunks. Same price as the creamy variety ($1.79, 18oz), and you can’t beat it! The only downsides to this variety is that there was one jar I was disappointed with. It had minimal flavor and was too thick. I was actually debating whether or not I truly ever liked the brand, but it was just a fluke. Since it’s natural, every batch is slightly different, perhaps it was less roasted or salted. And another time I got a small piece of bark or wood (I hope), since it was too tough to be a peanut shell. But neither of these have deterred me from purchasing this peanut butter whenever possible! This organic variety costs quite a bit more, almost double. Using what I learned in “Economics for Engineers”, one would assume twice the quality or at least some flakes of gold in it. Overall, disappointing. The peanut flavor is decent but nothing to rave about. It was a little better with salt but still lacked in flavor. The texture is nice and silky, but a bit on the sticky side. I did find one use for it – it works well in banana pudding, since it is unsalted and it doesn’t steal the show, so to speak. However, there is no comparison to the non-organic version above. On the plus side, it tastes better than glue. I’ve often seen this brand but never purchased it before, probably because it’s fairly expensive, coming in at $6.99 for a 28oz jar. 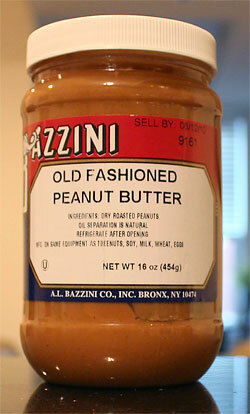 My mother purchased 2 large jars of it for me, mistaking it for the 365 crunchy peanut butter. Regardless, this peanut butter has nice large chunks that have a very good crunch. It is very creamy between the chunks and has an overall stickiness as a result. It comes unsalted, so I recommend adding some kosher salt. Overall, it’s very similar to Krema Crunchy. Good, but for the price I’d rather get double the amount of the 365 brand. This is one brand that I have never seen nor heard of and I have the Peanut Butter of the Month Club to thank for this one. It comes in a cheap plastic container (on the right) that was dented from being vacuum packed, and the label was printed poorly and affixed crooked – I didn’t have high hopes for this brand. Despite it’s lackluster appearance, this peanut butter delivered on flavor but even more on texture. This peanut butter has a nice rich peanut flavor and a very smooth grind. The texture was unlike anything I’ve had before. It is almost fluffy, like buttercream frosting. It is smooth and airy, and goes down with ease. I generally dislike unsalted peanut butter but this one is fantastic. Even so, I mixed in some kosher salt to suit my tastes. This peanut butter is apparently made in the neighboring city of Manhattan, at a small shop in the Tribeca area. I’m hoping to go pick up some more! This is a good standard peanut butter that you can find in almost any store. It is similar in texture to 365 but not quite as coarse and grainy. It is a little too salty but good when used to make spicy peanut butter. I’ve had this brand several times and the flavor and color range from a medium to dark brown, representing the level of roasting. The peanut flavor is decent but gets overwhelmed by salt. I forget the cost, but it’s certainly a better option than Skippy. 365 organic chunky is my go-to. the best I’ve ever tasted in pb and I’ve tasted a lot. Hmm, that one I haven’t had yet. I’ll have to add that to my list! I hope it has more flavor than the organic creamy. It seems hard to come by. I spent a few minutes looking for it online to no avail. I can barely find proof that it exists! I just discovered Smucker’s natural extra crunchy peanut butter and it’s my new favorite! I used to really enjoy the Smart Balance peanut butter, until I started noticing it smelled like fish! I always call the company and complain but things have not changed :( I miss it! Like fish? That’s horrible. Funny though, because I’m out of town this week and decided to try a new brand while I’m traveling. I almost got the Smart Balance one but opted for Jif Natural instead. Does it smell that way when you first open it or later on? Maybe the added oils (flax and others) are going bad quickly. I love salt and I especially love my peanut butter salted but I find the Smucker’s brand to be too salty. It has a good flavor but way too much salt, or maybe it was just the batch I had. I like to take peanut butter and spread it thinly across piece of toast and then run it under the broiler till the peanut butter bubbles. I can’t wait till it cools down enough to eat so I usually end up burning the roof of my mouth but it is so good! I still need to try this! Just wait till it cools down before taking the first bite! Yum! Great reviews! I love it here! 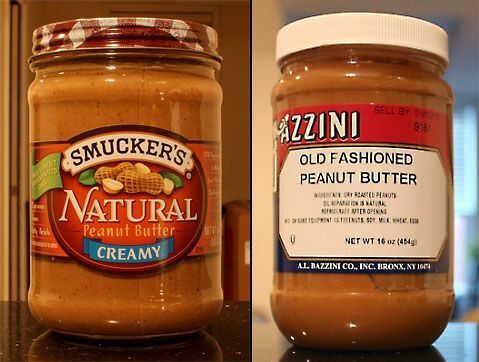 I’ve got some good tips for that, read the peanut butter boy method for storing peanut butter. Essentially it boils down to doing one good stir to begin with and splitting it into separate jars, keeping one out and one in the fridge. Less stirring the entire jar and spilling over the edge. It’s glorious, I can’t wait for the next shipment! Yes, the peanut butter tasted like fish right away, and smelled like it. I found that some of the jars were worse than others. I called the company and they said that the flax sometimes has that type of smell. I think they are all rancid! It’s just not a normal smell, at all, and I was so turned off. When the Smart Balance does not taste like fish, it’s some of the best peanut butter I have EVER had! IF not the best. as always, love your peanut butter reviews! I just wish 1/2 of these brands were available in Canada! Haha, thanks Anne. I just found that you can buy Arrowhead Mills online at Vitacost.com. But some of the better brands I’ve reviewed prior are available to ship (Naturally Nutty, Eastwind) from the company themselves but then you’d need to pay for shipping. Best bet, take a border trip and stock up. Rent a truck if you have to! Just popping by to say great reviews! Love to read your site. :)THe Smucker’s Natural is the same company that makes Laura Scudder’s. I have to say they are pretty similar in taste–but I agree that it’s a bit too salty. I really want to become part of the PB of the month club! How fun! Oh really, I didn’t know that. I was really unimpressed with the Laura Scudder’s when I reviewed it here but I like the Smucker’s a bit better, although it is quite salty. I highly recommend the PB of the month club but for some reason my shipments have ceased. I’m not sure why and I’m quite bummed about that. Oh but wait, I think you might be mixing up Laura Scudder’s with Adams Natural. Adams is owned by Smuckers, is Laura Scudder’s owned by them too? Oh wow, they’re both owned by Smucker’s. That’s weird considering I’ve seen Laura Scudder’s, Adams and Smucker’s all selling in the same store. It’s even weirder that Laura Scudder’s natural PB is WAAY better tasting than Adams. Yea, I don’t get it – Adams is TERRIBLE. I reviewed it here a while back. Mmm…I like the Smuckers best of what I can find locally in the chain grocery stores. My toddler is put off by the texture I think…gonna have to get some “buttah” that’s a bit smoother for her. I would just say one thing to you and that is, “FANTASTIC”!! Keep it up and wish to get more details from your blog. My favorite peanut butter is Trader Joe’s crunchy unsalted. I suppose that I am not much of a purest because I usually add a touch of honey to my natural peanut butter to reduce the “sticky” and oil separation for the benefit of my “streight from the jar” addiction. Be that as it may, I wuld like to get your reading on the Trader Joes PB for, in contrast to most or the naturals I have found, the peanuts are both unblanched and dry roasted. I love Trader Joe’s peanut butter, specifically the natural creamy and the crunchy valencia w/ flaxseed. I reviewed the natural creamy: here and the valencia w/ flaxseed: here. Their natural creamy is the thinnest, creamiest peanut butter I’ve ever found. It’s great for making flavored peanut butters, specifically Cinnamon Raisin and Hot & Spicy, my two favorites.